bl.uk > Online Gallery Home	> Online exhibitions	> Asia, Pacific and Africa Collections	> U.S. Club, Bangalore, 1902. 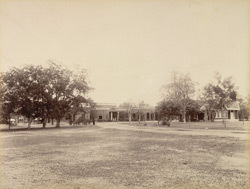 Photograph of the United Services Club, Bangalore, from the Macnabb Collection (Col James Henry Erskine Reid): Album of Indian views, taken in 1902 . The United Services Bangalore Club (now called Bangalore Club) was established in 1868 for the exclusive use of British troops stationed in the cantonment. It has had many distinguished members including Sir Winston Churchill.